What's the best way to brace a cruck frame (Russell, 1997 - edited). The wind braces in a cruck frame are of course rather important. In many cases they brace not only the roof but also the walls and consequently many cruck frames have no wall bracing. There are three basic ways. First, braces can run from purlins to the back of the crucks. Secondly, they can run from purlins and tenon into the crucks. Both these options have now been tried and I must admit I found them both quite a fiddle. The problem is, of course, that the braces do not lie in the plane of the roof. Next time the third alternative will be tried sensibly framing the braces in the plane of the roof to a solid pair of packing rafters. These observations are a description of how carpenters in the past chose to lay out and frame windbraces in cruck framed buildings, and it seems likely that they must have had to overcome many of the same problems as carpenters are likely to experience today. Frequently the question is posed "what did they do then" (centuries ago) ? At such moments one looks into the sky or down at ones feet and shrugs.To some extent building new frames is a form of experimental archeology: one learns a little about the past by our creations of the present. Benefitting from Henry Russell's observations we chose to fit eight windbraces to the two single piece purlins, with these fitted between the purlins and feet of the principal packer rafters to structurally stabilise the roof. "Anybody can put a tenon into a mortice and make a frame, but very few can make the braces fit". Fitting windbraces is quite a complicated process. The plane in which the windbraces lie is not quite the same as either the outside face of the purlins and / or principal packer rafters since the outside face of the purlins purlins are trenched and hence stand above the outsde face of the principal racker rafters. The windbraces were made from hewn boxed heart stock that was halved using a chain ripsaw to form matching pairs which had irregular form - some curved and others straight. These were set as matching pairs mirrored across the frame with the most pronounced curved braces set in the centre and the straighter braces towards the gable ends. The purlins have been set lower in the roof (below collar level) and so the braces have been set horizontally rather than vertically to ensure good racking resistance. 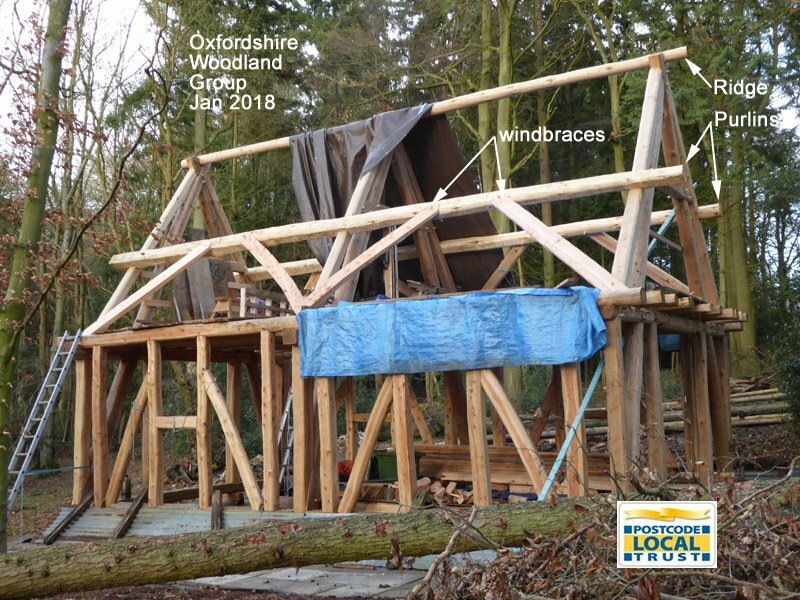 The design and fitting of windbraces to cruck frames is quite variable and so the best advice is to take into account the profiles of the cruck frames and the resulting geometrical arrangement between the plane of the roof and cruck cross frames. "This carries us back to the time of building of our old home now more than fifty five years ago; though only a lad we remember the time the trees were being felled in the woodland and, after a long wait for the timber to be squared, they were hauled to the building site, and, after a time for them to season, the carpenters came, as though but yesterday, we see them under the trees astride the timber with auger, chisel and mallet working away from morn till night .... those were the days of toil, days of contentment and peace." It would appear that nothing much has changed under the sun in over a hundred years. BENSON, T., 1980. 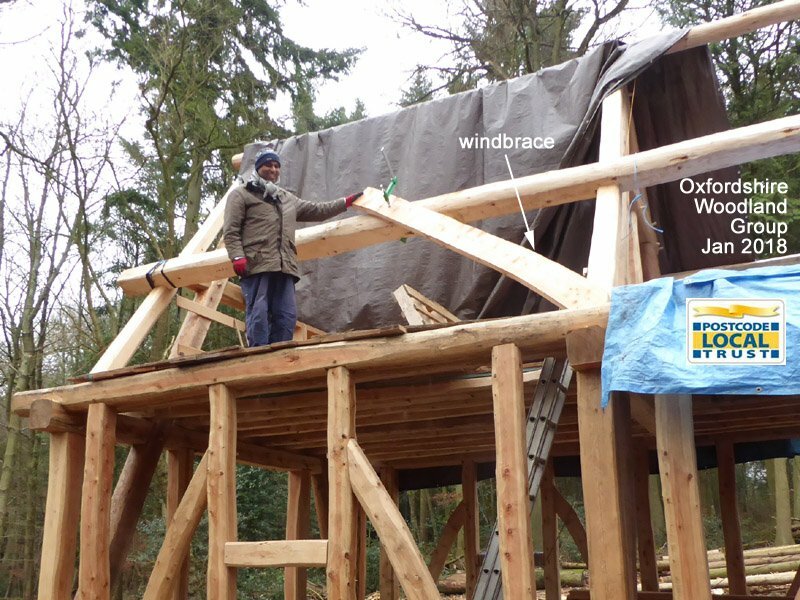 Building the Timber Frame House - The Revival of a Forgotten Craft. New York : Charles Scribners &Sons. RUSSELL, H., 1997. Notes on Cruck Creation. The Mortice and Tenon, No 6, 8-10.